This is your database to view and work on your voter universe. The filtering function allows you to segment your voters and put them together into Groups. This section contains all of the information that you have available within our database. We have the options to select whether we wish to view data based upon People, House, Street, or Groups; to Search our database; as well as to select any of the results present. Individual information may be selected to review an entry in its entirety, or to be edited. The Quick Icons, provide options to to Quick Edit (people or houses), Quick Canvas, or Quick Map View an individual. 2. A new person can be added by selecting an existing house, followed by the Create Person protocol. While A new house can be created by selecting Create House. 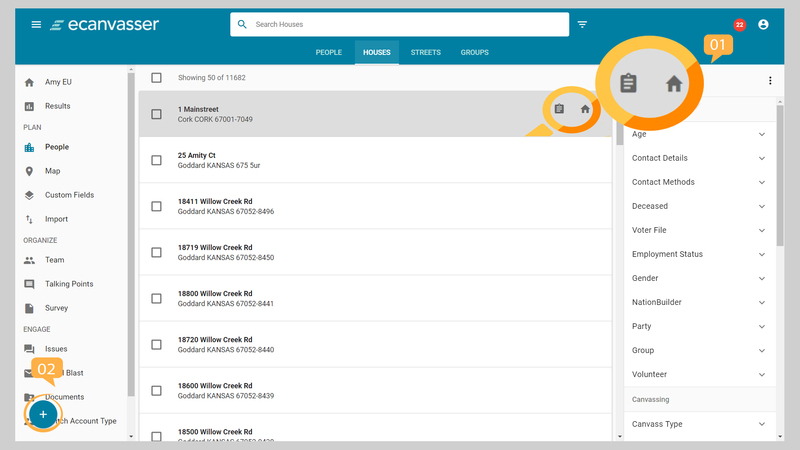 You can use the (1) Search function (in tandem with the Filter function should you wish) to isolate a segment of People, Houses, Streets, or Groups, based on your (2) search term. The Filter Function works similarly to the search function, in that it allows you to segment your people database. Filtering is based on the information you have on your voters; for example, whether or not they have been canvassed or surveyed, survey results, age, gender etc. Once you have created a Group, either on the People page using filters, or on the Map page using the Create a Group button, you can now use that Group. Here is how that can be achieved. *It should be noted that if you wish to pre-populate any of your custom fields, this is required to be performed during the upload of your Voter File. Thereafter, the custom fields may of course be created but they will not be pre-populated with information.